An Irish-medium school or ‘gaelcholáiste’ is a post-primary school in which everything is done through Irish, and which uses the immersion education method (explained below). Irish-medium schools are funded by the State under the same conditions as other schools, and follow the standard post-primary school curriculum. 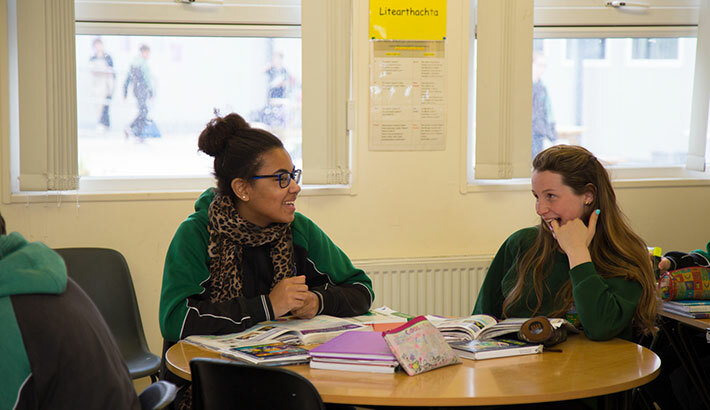 Irish-medium schools welcome students from every linguistic, cultural, religious and socio-economic background. Irish-medium post-primary schools are run by various school patrons. The patron is the authority in charge of school management. Patrons provide guidance and support for school principals and boards of management, and the patron is responsible for the promotion of the school’s ethos. A school’s religious ethos is determined by its patron. Some Irish-medium post-primary schools are denominational (Catholic) and others are multi-denominational. The main aim of an Irish-medium post-primary school is to provide excellent education through the medium of Irish, to give students the social, intellectual and technical skills that will help them to become rounded and happy adults. Irish-medium post-primary schools cater for the needs of each individual student, to foster the understanding, skills and values they will need to live a fulfilled and successful life. Immersion education is a system which helps students to become fluent in Irish naturally, by giving them daily experience of an Irish-speaking environment. This means that all subjects, apart from English, are taught through the medium of Irish right up to Leaving Certificate level. It also means that Irish is the language of communication in the school, both inside and outside the classroom. In this way, students’ fluency in the language is supported. What is an Irish-Medium Post-Primary School?